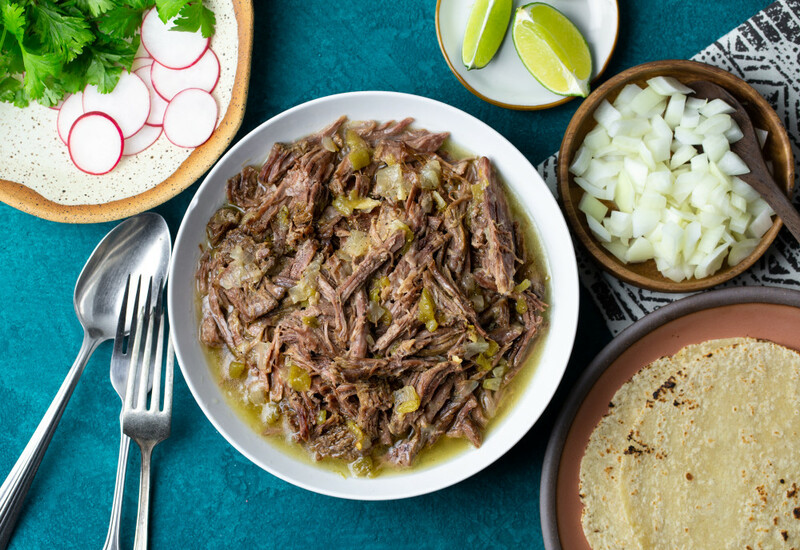 This Mexican-inspired recipe for machaca beef is super simple to make using beef chuck roast, green chiles, and onion. Serve it as a main dish with tortillas, lime, radish, and cilantro on the side. It fits well into many diets and lifestyles, including paleo, Whole30, gluten-free, and omnivorous. Season roast on all sides with salt and black pepper. Heat a skillet over medium heat; brown roast in the hot skillet, 1 to 2 minutes per side. Put beef broth, onion, green chiles, lime juice, garlic, dry mustard, 2 teaspoons salt, and 2 teaspoons black pepper in the inner steel pot of pressure cooker. Place roast on top of onion mixture. Transfer beef to a cutting board and rest 5 to 10 minutes. Shred beef with 2 forks. Remove bones and fat. Pour the leftover broth in the pressure cooker through a sieve and mix shredded meat and strained broth together in a serving bowl. Make a big batch to eat through the week for lunch or dinner and freeze any leftovers in a freezer bag laying flat on its side.You can defrost the whole bag or break off pieces as needed. Per Serving: 308 calories; 18g fat; 6.0g carbohydrates; 31g protein; 94mg cholesterol; 1499mg sodium. This is not the traditional machaca beef that I am familiar with. With that said, I really liked this shredded beef recipe, it makes a great filling with tacos. I added bell peppers, onion, and jalapeño for more flavor and was really satisfied by how it turned out. Great addition to my weekly meal prep and is quicker than using a crockpot.